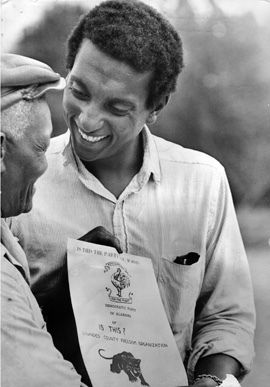 Stokely Carmichael, a political activist who was active during the 1960’s civil rights movement was born in Port of Spain, Trinidad, West Indies on June 29, 1941. His family later moved to New York City and he stayed with his grandmother until later moving to New York with his family at age eleven. He is well known for his activities with (SNCC) the Student Nonviolent Coordinating Committee where he served as Chairman. The organization’s philosophy became increasingly more radical under his tenure. He is credited as perhaps being the first person to publicly use the term “Black Power” in a speech on June 16, 1966 in Greenwood, Mississippi following the shooting of James Meredith. Carmichael later joined the Black Panthers and became “Honorary Prime Minister” and left SNCC. He left the Black Panthers in 1969 and moved to Guinea and worked as an aide to President Ahmed Sekou Touré. He died on November 15, 1998 of prostate cancer in Conakry, Guinea.